As you may have heard, Power Pirate is travelling to Anaheim, CA for the weekend to participate in the 2010 NAMM SchoolJam Battle of the Bands. We will be playing along with 9 other bands, and there are a number of prizes. One of these is the “Fan’s Choice” award, which is decided by the number of votes received via text message after the end of the show. To support Power Pirate, you can vote UP TO FIVE TIMES from a single number. Just send “Pirate” to 99299 between 9:00-9:30 pm EST on Saturday, January 16. Remember, each cell phone can vote up to 5 times, so make sure to get friends and family involved. Thank you all for your constant support. I will be tweeting about news and events, and I will be uploading photos there via twitpic. 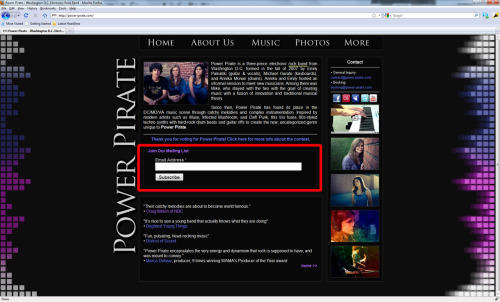 http://power-pirate.com has been our online homepage for about a year and a half now. It has gone through 2 major layout changes, and comes up first when you Google “Power Pirate”. We are quite happy with it. Recently, we’ve seen some problems with the name, though. At the time when we started using power-pirate.com, powerpirate.com was already taken. However, with our recent NBC interview and with the amount of new fans coming to shows, it’s become clear that saying “power hyphen pirate dot com” is really inconvenient. We got lucky. I looked in mid-December to see when the current owners’ hold on powerpirate.com would expire. At the time, it would expire in 15 days, after being held under the same owner for up to 10 years. I started investigating what the best way for us to get a hold of it would be once it expired. Enter the domain resale sharks – pool.com, snapnames.com, and godaddy.com. The way their business works is that once a domain is no longer being renewed, it goes through a couple stages before it is available for others to buy. In this pre-release period, you can backorder domains. Power Pirate used snapnames.com to get powerpirate.com. It is considerably more expensive than GoDaddy, but we read some negative reviews about the former. Using SnapNames was playing it on the safe side, and in the end we got powerpirate.com with little trouble… just a big bill. 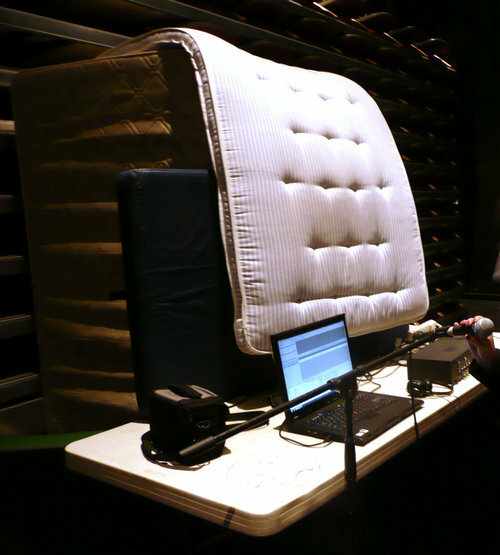 Emily brought the vocal booth in to school to demonstrate how Power Pirate had recorded. Students enjoyed crawling inside and singing along to instrumental versions of songs. 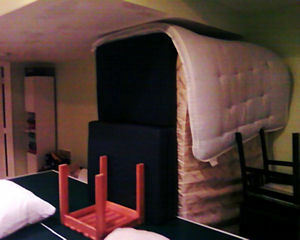 Many were surprised by how small and uncomfortable it was, and that the only way to get in was by crawling under a table. Updates and New Online T-Shirt Store! So, as you may have noticed from the Power Pirate Twitter & Tumblr accounts, there has been a surge in Power Pirate activity in German. Yes, there is a new German Power Pirate website. There is a German press release out. And lots more. This is all thanks to a super-fan in Germany named Falko, who has been helping us with creating a plan on how to further expand our German audience and with TRANSLATIONS. Enjoy! We’ll keep everyone posted. Mailing list widget on our homepage has been updated to a more convenient one. Subscribers will no longer be asked to sign up for a ReverbNation account when subscribing to our mailing list. Now, new subscribers will only be asked to confirm their subscription from their inbox! We finished tracking guitar for a song called “Night Drive,” to be released on our album this coming year. I’d like to elaborate a little bit on the process in case anyone else is considering doing the same. We had the screen made (to save money on screen and photo emulsion) by a local art store. They used one of their old, somewhat damaged screens to give us a break on the price. We then bought Speedball Opaque Fabric paint. It was around $8 for each 32 oz container of paint. We purchased gold, blue, red, and white. A squeegee added another $8 or so to our bill. (Careful, if you’re printing on black shirts you MUST buy opaque paint!) As you can see in the video, we used a weird screen printing technique. Instead of dragging the squeegee across the screen on the shirt, we would cover the stencil on the screen in a very thick layer of paint. This is because our cheaply made screen was uneven in how well it allowed paint to go through. The unevenness in the screen resulted in a lot of time wasted. We often had to hose down painted t-shirts to remove paint after a mistake had been made, dry them, iron them, and then try again. I suppose that the moral of the story is that if you make your own shirts, try not to save too much money on your screen! we bought our black t-shirts at Corporate Apparel Unlimited, our screen printing supplies at the Utrecht Art Supplies store in downtown DC, and the skull design was generously contributed by Marc Harkness. 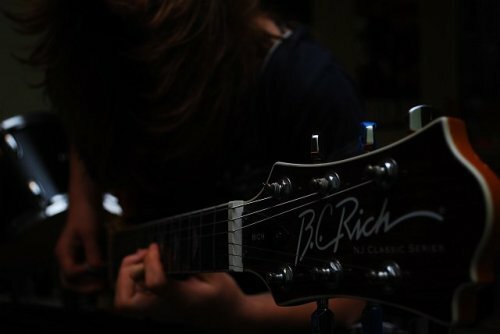 Updates: NAMM Contest Win, the Black Cat, and more! Thank you for everyone who voted for us in the NAMM SchoolJam Battle of the Bands. We won! We placed in the top two in our region, and on January 14th, we’ll be going down to Anaheim, CA for 4 days to compete in the finals! There will be a live Battle of the Bands at the 2010 NAMM Show in which Power Pirate will be performing. Every vote submitted helped, and we are humbled to see how loyal our fan base is. Also, thanks to everyone who came out to the Black Cat last night! We played on the mainstage with Once Okay Twice and Loose Lips. It was a really energetic show, and the other two bands were fantastic. We’ll keep you posted. Thanks for everything. We are considering making a poster for Power Pirate fans. We wanted to make it not just reminiscent of the band, but also a cool photo to look at. Naturally, it would have to be high enough quality to be able to blow up to poster-size, too.